Is it really possible to make your creative passion a livelihood? Deep in our minds, there’s a collective embedded notion that our creative passions don’t translate into money or a real career. It thus makes carving out a career in such industry difficult as its demands like artistic perspective, technical skills, and an entrepreneurial spirit aren’t taught extensively academically. But now, slowly in our country, the creatives are breaking this archaic impression. To know the details on how creatives, particularly those who work independently, thrive, there will be an intimate conference on funding independent creative pursuits for storytellers. 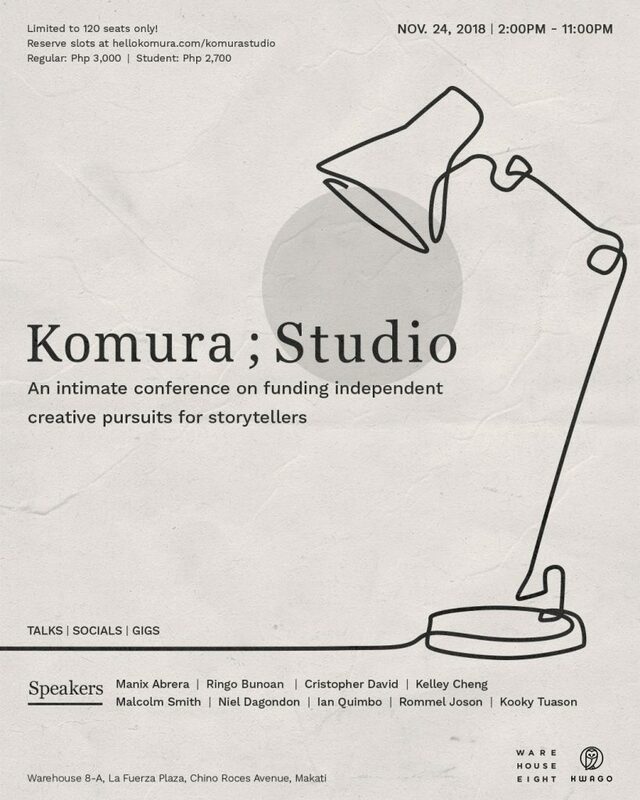 Komura; Studio is bringing “industry shakers and creative doers” from Manila, Singapore, and Indonesia to talk about turning passion into livelihood. From the Philippines, here are the following panelists: Artists, curator, and co-founder of Artbooks PH Ringo Bunoan; spoken word artists and radio host Kooky Tuason; Veer Technologies and VR Philippines founder Cristopher David; comics artist Manix Abrera; designer and Diyalogo co-owner Ian Quimbo; artist and educator Rommel Joson; and computer scientist and multimedia arts school CIIT founder Niel Dagondon. Indonesia-based artist and Krack! Studio, a printmaking studio and gallery in Yogyakarta, co-founder Malcolm Smith will be present, as well as Kelley Cheng, founder of The Press Room Singapore, a design and publishing consultancy. Head to Warehouse Eight, La Fuerza Compound, Makati on Nov. 24, 2 to 11 p.m. and register here for as early as you can as the event is limited to 120 seats only. Regular tickets are priced at P3,000. Students get a P300 off. The tickets are inclusive of admission to nine talks, a Komura; Studio kit, afternoon snacks, unlimited coffee by Candid, and a gig. Tickets at the door will be P3,500, subject to availability.